Don’t know about you, but I love cheese. Just about any kind. In our house we tend to eat more cheese during the cool winter months, but the arrival of warm weather doesn’t mean we give up cheese altogether. Far from it. Rather, aged cheese tends to give way to fresh cheeses like ricotta and—especially—mozzarella. I will never forget the first time a true mozzarella in its production zone (Campania and southern Lazio). It was a revelation: a moist, soft but springy texture and a creamy taste with just a slightly tangy aftertaste (the sign of a true mozzarella di bufala, made with the milk of water buffalo). Sadly, real mozzarella does not travel well; even in Rome, just a few kilometers to the north, it was hard to find mozzarella that tasted as good as it did on its home turf. Don’t ask me why. In this country, much of what is sold as ‘mozzarella’ is rubbery and tasteless, and, if you ask me, even ‘artisanal’ mozzarella is generally nothing to write home about. (One exception, the legendary Joe’s Dairy in New York, recently closed its doors.) Perhaps some day I’ll find a truly delicious mozzarella made locally, but in the meanwhile, the imported variety is well worth seeking out, especially if you want to eat your mozzarella uncooked, say in an insalata caprese. 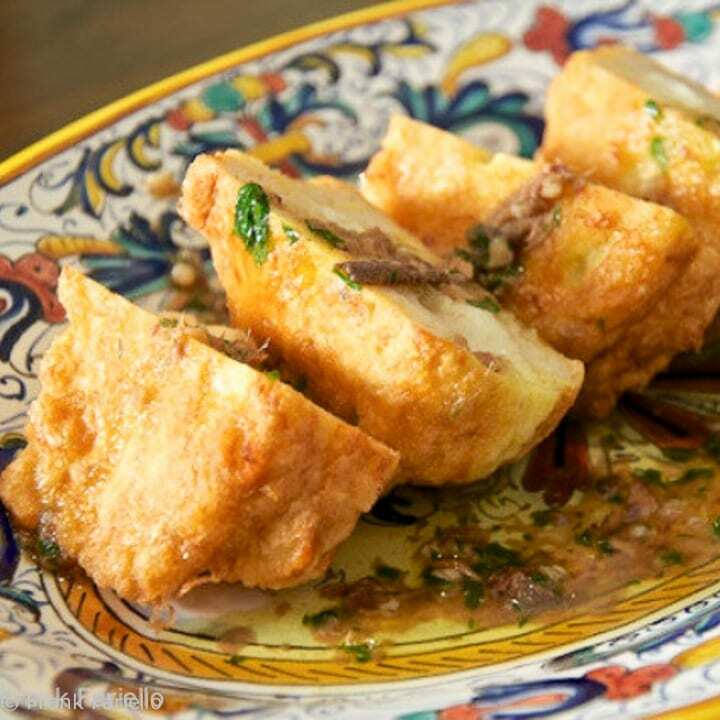 Mozzarella in carrozza, literally “mozzarella cheese in a carriage”, is one of the rustic glories of Neapolitan cuisine. It’s a kind of savory French toast, or a kind of grilled cheese sandwich, only fried. Like either of these cousins, it’s rather easy to make. And very flexible, which is why this recipe doesn’t give much in the way of measurements—just keep going until you use up your bread and cheese. Count about 1-2 sandwiches per person as an antipasto, more if you’re hungry or using the dish as a piatto unico. The great thing about this dish is, you don’t need the best quality mozzarella di bufala to get acceptable results, although, of course, the better the cheese, the tastier the dish. Dip each mozzarella sandwich, on both sides, in the milk until nice and moist, then in the flour, then in the beaten eggs seasoned with salt and pepper, making sure the bread is well impregnated with the egg. Then fry each sandwich in the oil over moderately high heat until golden brown on each side—a few at a time so that you don’t crowd the frying pan. As the sandwiches are done, transfer them to the rack while you fry the rest. When they’re all done, sprinkle the sandwiches with salt and serve immediately. Mozzarella in carrozza is traditionally served just like this, perhaps with lemon wedges on the side. But I like to gild the lily by serving them with a bit of anchovy sauce: you empty a tin or jar of anchovies with some olive oil in a saucepan over moderate heat. Stir until the anchovies have broken up and are sizzling, then add a tablespoon or so of water. The anchovies will almost instantly form a smooth sauce. Add finely minced garlic (a garlic press works well here) and parsley. Stir once, then remove from the heat. You can spoon this sauce on top or around the sandwiches or, since anchovies can be ‘controversial’, in a sauceboat for those who want it. Best quality mozzarella tends to be rather runny, so let the slices drain for a minute or two and pat them dry before using them. And whatever kind of mozzarella you buy, be sure to serve the sandwiches soon after they’re cooked. Even best quality mozzarella tends to harden disagreeably if melted and left to cool too much. As for the bread, good quality sandwich bread (called pan carrè in Italian), should work fine and is used by many Italians. Personally, I like homemade or artisan round breads for their firmer, chewier texture. Speaking of which, bread that is a day or two (or more) old works very well. In fact, it is likely that this dish (like French toast) was invented to make good use of stale bread. A firm texture is what you need—if the bread it too fresh or too soft, it may fall apart when dipped in eggs and milk. When using loaf bread, the slices are typically trimmed and cut into triangular wedges. If using a rustic loaf, you can use a cookie cutter to cut rounds out of the slices, or simply cut them with a knife into squares. The mozzarella sandwiches are traditionally fried in olive oil, and it really is the best way to do it. But you need not use your best extra virgin olive oil for the task. In fact, ‘pure’ olive oil, perhaps enriched with a good pour of extra virgin for flavor, work well at less cost. In a pinch, canola or other vegetable oil will do fine, although again, what you lose in flavor you should make up with extra seasoning. Mozzarella in carrozza is easy to make, if a bit messy. The only tricky part is making sure the sandwiches don’t fall apart in the frying process. Besides using the right kind of bread, make sure not to overstuff the sandwiches with cheese. If you do, the slices of bread will not make contact and adhere one to the other. Then you need to make sure that the egg—which will bind the bread slices together—impregnates the bread. To do that, you can even leave the sandwiches in the egg for a few minutes before frying. Then allow the sandwich to fry until golden brown before turning it over:this will ‘set’ the egg. Finally, turn the sandwiches carefully, using a flat spatula and a fork or spoon to support the sandwich as you turn it. Then let it cook thoroughly on the other side. There are various ways to dip the sandwiches. The ingredients are always the same: milk, flour and seasoned egg. But some recipes call for mixing the egg and milk together: you dip the sandwich in the egg and milk, then in the flour, then back in the egg and milk. Or, you can actually mix all three ingredients to make a kind of batter—or pastella, as they call it in Italian, in which you dip the sandwiches. See which way suits you best. There are some variations. You can add an anchovy filet on top of the mozzarella as part of the ‘stuffing’ or you can add a slice of ham. In either case, omit the anchovy sauce, which would be redundant in the first case and discordant in the second. Mozzarella in carrozza is usually thought of as an antipasto, but I find it satisfying enough to serve as a piatto unico, or one dish meal, or as a savory snack. Follow it with a green salad and some fruit. Accompany with a robust wine, either white or red. By the way, if you have leftover beaten egg, don’t throw it away: Add a few spoonfuls of any leftover flour, then add some grated cheese (either Parmesan or pecorino) and some chopped parsley, together with a good grind of pepper. Fry this very loose batter in the olive oil. You’ll wind up with some free-form egg fritters that might not be very pretty, but are really tasty. Dip each mozzarella sandwich, on both sides, in the milk until nice and moist, then in the flour, then in the beaten eggs seasoned with salt and pepper, making sure the bread is well impregnated with the egg. Then fry each sandwich in the oil over moderately high heat until golden brown on each side—a few at a time so that you don't crowd the frying pan. As the sandwiches are done, transfer them to the rack while you fry the rest. When they're all done, sprinkle the sandwiches with salt and serve immediately. Mozzarella in carrozza is traditionally served just like this, perhaps with lemon wedges on the side. But I like to gild the lily by serving them with a bit of anchovy sauce: you empty a tin or jar of anchovies with some olive oil in a saucepan over moderate heat. Stir until the anchovies have broken up and are sizzling, then add a tablespoon or so of water. The anchovies will almost instantly form a smooth sauce. Add finely minced garlic (a garlic press works well here) and parsley. Stir once, then remove from the heat. You can spoon this sauce on top or around the sandwiches or, since anchovies can be 'controversial', in a sauceboat for those who want it. Cheese is defenitly my favorite food, so I have to cook this in near future. But I`m not a Mozzarella Fan even Buffalo tastes a bit plain to me. Can I use any stronger cheese… I thought of an aged Pecorino, Parmigiano or tasty soft cheese like a good Taleggio, Goat Cheese, or maybe Fontina too. Is it common in Italy to prepare this Cheese Sandwich with other cheeses, or is mozzarella the “one and only”? And thank *you* Joe, for stopping by! We always used to order this as an appetizer at “La Pietra” Restaurant (now closed) in Yonkers, NY. This place is sorely missed!!! Glad I could bring back from fond memories for you, Susan. Here’s a modification that works well, and I credit my grandmother Pitarra for this. If we were good, she made Mozarella en Carrazzoa for us. Use three slices of bread, thinner the better. Take a drinking glass and cut center from one, then fill it with the mozarella and sandwich between then other too. The mozarella melts like glue to the top and bottom without running out the sides. Sounds very attractive, Andy. Will have to try it that way next time. Thanks for the tip! Looks delicious! I have never heard of a sandwich like this but it sounds wonderful! Thanks for sharing! And thank *you* for stopping by! Frank, this post brings me right back to my childhood. We used to stop for lunch in L’Aquila on our way from Rome to our beach house on the coast of Abruzzo. This was before the autostrada, and the trip took more than 4 hours. The little bar/cafe that we stopped at served freshly fried mozzarella in carozza. So tasty. My mom and aunts would make this for dinner sometimes in summer. Paired with a salad it’s the perfect summer dinner, in my opinion. Thanks for reminding me of it. Need to make it for my kids! Glad I could bring back some fond memories! And I couldn’t agree more—wonderful for a summer dinner! one of my favorite things to have for dinner!!! Who could resist this? Not I, that’s for sure. I know what you mean about eating the mozzarella fresh from the latteria in Campania. There’s nothing like it. But sadly, because of illegal dumping there of many harmful industrial wastes, I’m careful not to overdo it eating mozzarella when I’m in the region. Can you believe I never had mozzarella in carrozza? It might be time to fix it! One of my favorite Italian classics! Anything with melted fresh mozzarella….yum! One of the delicacies my Godmother always made for us. Thanks for the memories, Frank! Oh my, for me, as for Simona, this one brings back memories! Thanks, Frank. When I was a kid, we often pleaded with my mother to get mozzarella in carrozza. And I had to laugh when I got to the end of your post because indeed I had those fritters too, and you made me remember. And I thought I had “invented” those fritters! Oh well….